The town of Huron, in Dakota Territory, was a growing, bustling little town situated along the tracks of the Chicago and North Western railroad. In the early 1880s, the influx of settlers, businessmen, and railroad workers produced a demand for lodging, and numerous hotels sprang up to fill that need. On the corner of what was then First Street and Kansas avenue sat the Menzie House, one of Huron’s many early hotels. A two-and-a-half-story building, it also included a livery stable further down the street. Like other hotels in booming towns along the railroad, it saw its share of guests. And in the case of the Menzie House, it saw its share of trouble, too. 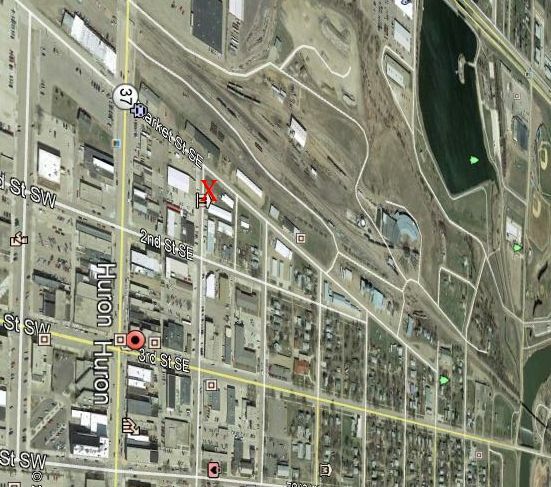 Above: The red "X" shows the location of the Menzie property, with the hotel to the left, and the livery stable to the right. 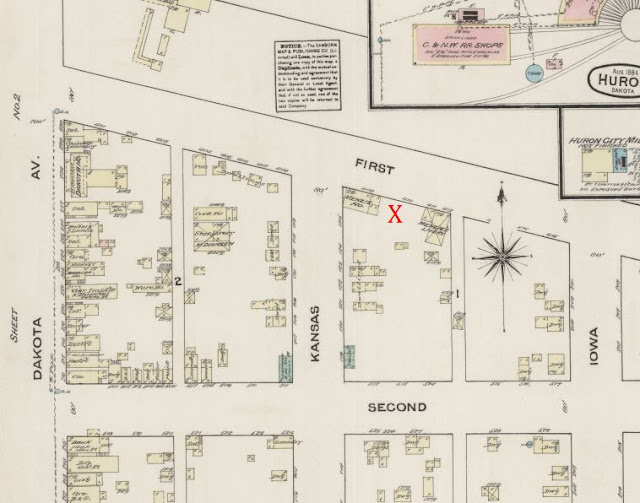 Below: the same area, with the red "X" marking the location of the hotel. The hotel was opened by New York native John W. Menzie in 1883, and was described in the local newspaper as “well-kept and furnished, with large, bright rooms.” Mr. Menzie, the article elaborated, “takes pains in making his house inviting in its arrangements, its cleanliness and the splendid table regularly set before his guests. As a host Mr. Menzie has the happy faculty of making his guests feel at home, and pays strict attention to the many details that help to make a hotel a success, and which disregarded are sure to bring failure.” But, at some point details were indeed disregarded. What brought the Menzie family to Huron isn’t known, but their tenure in the town, and in the hotel business, was about 10 years. And in that time, they lost a barn to fire, a child to death, had another child abducted, had one employee kill another, had a patron claim to be drugged and robbed, and another patron died refusing to divulge his identity. In addition, Mr. Menzie was arrested several times on charges relating to his operation of the hotel. Perhaps good help was hard to find in those days. Or perhaps Mr. Menzie wasn’t particular about his employees. It was in August of 1886 that Menzie’s livery employee, Nathan Freeman, described as easily angered, killed Joseph Kessler, another Menzie employee. Kessler, also described as “high-strung and quick-tempered,” was in charge of the general operations at the hotel. Kessler was critical of Freeman’s handling of the horses, and his expletive-laced “suggestions” to Freeman were not well-received. An argument with “coarse words” and a scuffle broke out, but they eventually separated with little physical harm done, except for a scratch on Kessler’s face which infuriated him. Kessler made some threats, and threw a punch. Freeman headed for the hotel building to find Mr. Menzie, intending to resign, but by the time he got there he decided to go home to have his mother sew his ripped shirt and return to his duties in the livery. Before returning to work, however, he grabbed a revolver and took it back to work with him. Back at the livery, witnesses say that Kessler continued to harass Freeman, and Freeman could be heard telling Kessler, “Don’t come near me – keep away from me!” But Kessler continued toward him, so Freeman took out his gun and raised it to fire, but Kessler hit Freeman’s hand to try to knock the gun from it, and it discharged, entering Kessler’s left temple. He fell to his knees, then prone to the floor. Dr. Huff did all he could do, but the bullet was lodged deep in Kessler’s brain, and he never regained consciousness. He died a few hours later. Freeman was arrested for murder, but was later acquitted of the charge. The site of the old Menzie Livery, where Joseph Kessler was killed. A few years later, the Menzie’s four- year-old adopted daughter, Edith, was abducted. Mrs. Menzie had been out shopping, and picked up a letter at the post office from the child’s birth mother, Ada Hawthorn, telling her that she “need not be surprised should Edith disappear at any time.” In fact she might be gone before the letter even reached Mrs. Menzie. Ms. Hawthorn clearly stated numerous reasons why the child should no longer remain in the Menzie family, but the primarly reason was that the Menzie House was not a proper home for her. It was late in the afternoon when Mrs. Menzie got the letter from the post office, and returning home, she began looking for Edith, but no one had seen her “for some time.” The police were summoned and felt confident that the child would be found and returned, and apparently at some point in time she was indeed returned to the Menzies. In 1893 J. Rosenthal took over the Menzie House and dubbed it “Hotel Columbia” and let the town know that it had been “thoroughly cleaned and repaired, and will be kept in first-class order.” What, exactly, happened after that isn’t clear, but it appears that John Menzie was back at the helm a short time after that. The Menzies made their way to Indiana, where they opened a used furniture store in Muncie, and opened another "Menzie House" hotel in Matthews, as well as adopted another daughter. 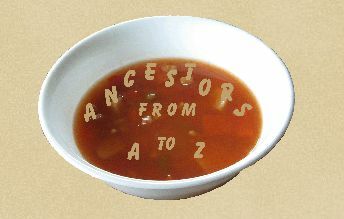 By 1910, they had moved to Ashtabula county, Ohio, where Mr. Menzie died in 1922. Market Road and Kansas ave.
Sioux Falls Argus Leader - Nov. 19, 1890; Jan. 5, 1895; Jan. 26, 1895; March 13, 1895.